In a large mixing bowl, whisk together dressing ingredients. Salt to taste. Set aside. In a large skillet, heat oil to medium heat. Season chicken breasts with salt and pepper. Cook chicken breasts in the hot oil 4-5 minutes per side, until internal temperature reaches 165 degrees. Remove from heat, allow to cool. Shred with 2 forks or roughly chop. Add chicken to the bowl with the dressing. Cook ramen noodles according to package directions, omitting flavoring packet (discard). Rinse noodles under cold water, toss to dry, then add to the bowl with chicken and dressing. Add cabbages, carrots, edamame, green onion and cilantro to the bowl with the chicken, noodles and dressing. Toss to coat. Taste and adjust seasoning, if necessary. Refrigerate until ready to eat. 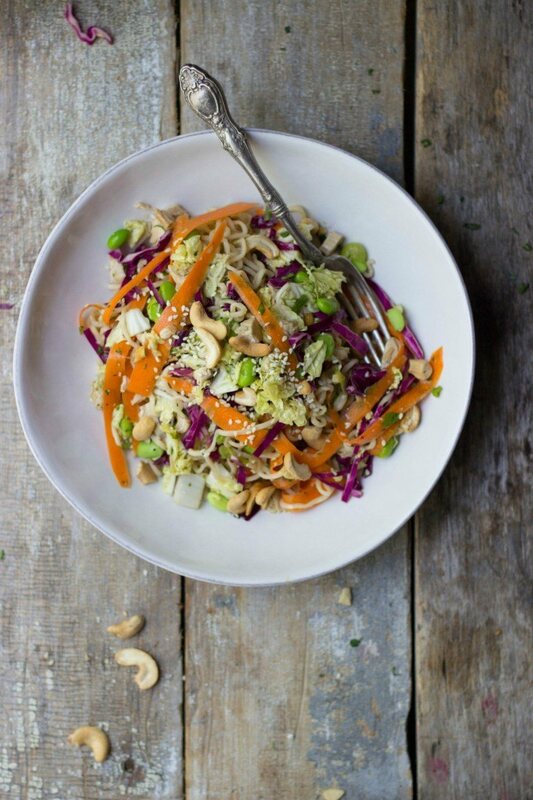 Serve with cashews and sesame seeds.